Years ago for Christmas, I was given a copy of the book Chicken Soup for the Soul® as a gift and I have treasured reading this wonderful book series ever since. Therefore, I was very excited to read one of the newest releases, Chicken Soup for the Soul® Miraculous Messages from Heaven. Written by Jack Canfield, Mark Victor Hansen and Amy Newmark this inspirational title seeks to show us that we can still keep a connection with our departed loved ones even after they have left this world. Chicken Soup for the Soul® Miraculous Messages from Heaven features 101 real-life stories of miracles from Heaven including, “amazing connections, sign from beyond, angels and answered prayers.” I am a woman of deep faith and feel strongly that life here on Earth is just one stop on our ultimate journey. Is it possible that those who have passed on can send us messages from above, in dreams or in unique and heartwarming ways? Having lost my Dad and my Aunt exactly three weeks apart in 2012, I was interested to read all of the stories compiled from this book. As a busy wife and mother, I appreciate that I can read as much or as little at a time because each short story can be read in just minutes. I like to read one story before bed and another in the morning over a cup of coffee while our kids are still sleeping. I appreciate the openness and candor that each contributor gives to us readers when sharing their personal stories and several stories touched me deeply. For example, I really enjoyed the story titled, “Turn the Page” by Laura D. Hollingshead which shared her wonderful connection with her departed dad who had passed away when she was just sixteen years old. I wept openly when reading “The Miraculous Meaning in a Name” about a young mother who died of metastatic breast cancer, the physician who cared for her and the miraculous experience guided from above in which they first met……simply beautiful! 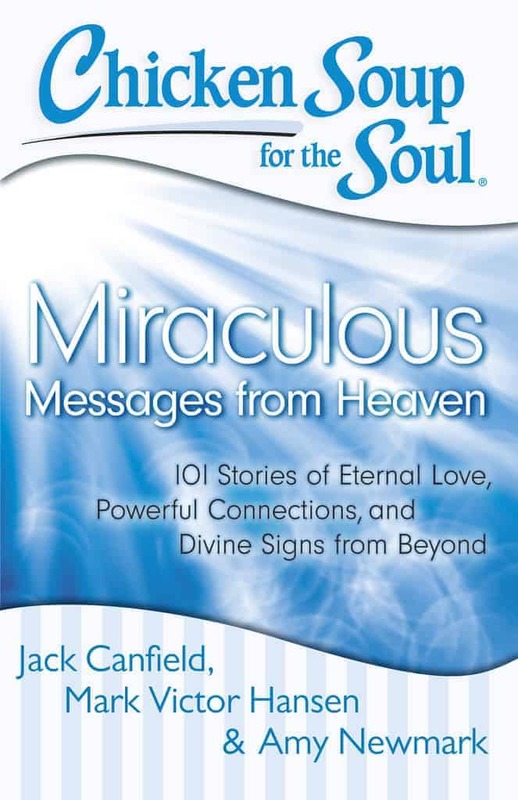 Chicken Soup for the Soul® Miraculous Messages from Heaven would be a wonderful holiday gift idea for anyone who has suffered the death or a loved one. As someone who has recently experienced my own losses, I can personally say that this book has helped me to revisit my faith, giving me encouragement and inspiration and it even led me to acknowledge the grief that I am still experiencing. You can purchase your copy of Chicken Soup for the Soul: Miraculous Messages from Heaven (SRP $14.95) as a paperback copy or the Kindle edition at Amazon.com. I believe that those who go first send us messages all the time. My brother passed away just before Christmas and as I was helping my mom find the Christmas decorations, a paper butterfly wafted down from the shelf. My brother told us that he would come back as a butterfly to see us. My mom and I had a quiet cry and then decorated the tree, with the paper butterfly in a prominent place. I hope I win, would love to read this book! I love the “Chicken Soup for the Soul” series. Such wonderful stories. This is great have a Happy New Year! I would so love to read this book. I believe messages are sent to us. Pingback: Purple Monster Coupons | Win a copy of Chicken Soup for the Soul® Miraculous Messages from Heaven! I agree on your review, this would be a great gift to give to someone, especially someone who has experienced a loss of a family member.